On Feb. 12, the Trump administration released its 2019 budget proposal for changes to make to the federal government’s spending. Many of the cuts in the plan are unlikely to become reality: Congress just increased spending limits last week, and it rarely dares to change entitlement programs. But the budget is an important signal of the administration’s priorities. After many years promoted as Republican orthodoxy, eliminating the federal budget deficit is not an element of this budget. 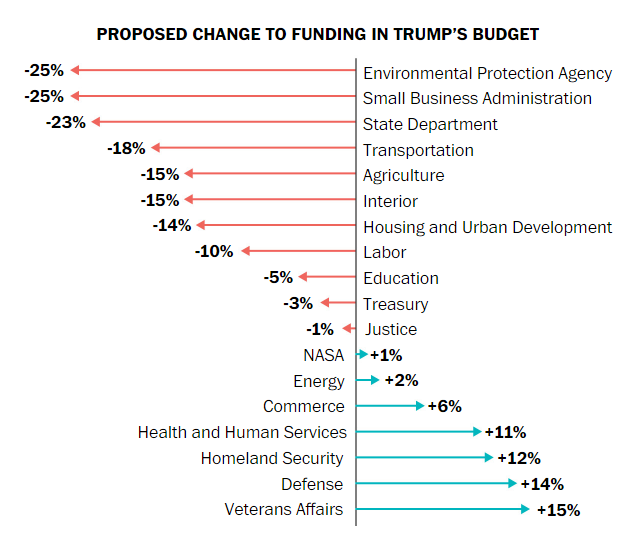 To pay for additional defense spending, the border wall and an infrastructure plan, funding would be cut from many executive departments and agencies, including big cuts at the Environmental Protection Agency and the State Department.